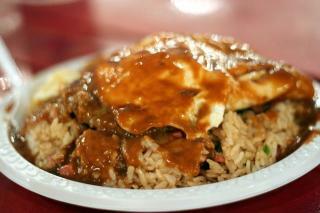 Ever since the 55th Annual County Fair, it’s been my civic duty to review the loco moco at the local county fair. I call it quality control. The loco moco at the 55th was one of the worst loco mocos ever. Impressively, they did a decent job on the 56th (last year). Again this year, the Keaukaha Warriors were responsible for the loco mocos. This was the double fried rice loco ($8). It looked almost exactly like last years, but once I started grinding ‘um, jus wasn’t the same. Fried rice was undercooked — still slightly hard in the middle of the rice and mushy on the outside. Also, either the gravy or the fried rice was too salty. The patty was the same old premade frozen patty, but at least they kept it juicy. The eggs were nice and yolky. 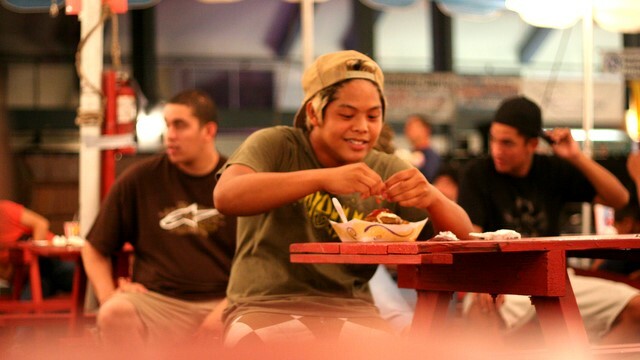 This entry was posted by James on Tuesday, September 18th, 2007 at 2:17 pm	and is filed under Hilo, Loco Moco. You can follow any responses to this entry through the RSS 2.0 feed. You can leave a response, or trackback from your own site. Howzit brah, sorry to hear of the let down. I just moved here from the mainland I just recently, Sunday @ the Maku’u Farmers Market, I tried my first Moco Loco. It was a “Double Loco” from Mr. D’s Ono Steaks. It was good but not great. I find the gravy they use was a pre-packaged kind and that just doesn’t fly with me. The rice was average and the patties were nice and thick (like my wife, LOL) and they eggs were “yolky” but everything else was lackluster. I am now in search of the perfect “LOCO” and ever since I found your site, I am a follower. Keep up the good work and thanks for putting your thoughts and food finds out there. Take care brah. wow brah…..nothing worse than bb shot rice eh? at least dey wen make da eggs right. Looks not that different from the gyros portions or pita’s here in Greece.